Family Art Studio is a unique parent/child art class offered in the evenings at the school that the children attend. Families come together during 6-8 weekly sessions to find inspiration, make art, and eat dinner. 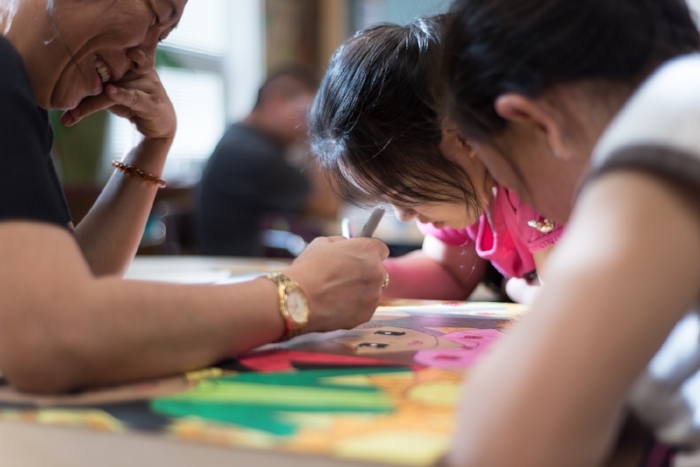 Parents attend art classes with their children to create work focused on building personal visual narratives that are specific to their experiences. A structured environment for parents to spend quality time in the school setting and build a sense of belonging in the school community. A place where students can instruct their parents and showcasing their skills and expertise in the art room. Parents and children negotiating a collaborative art making process. The theme for Spring 2017 was “If you really knew me…” For this session, Framework Arts collaborated with University of Utah faculty to conduct research examining among other things a) how the participation and negotiation with artmaking between the adult and child influences their relationship in the family and their sense of cultural and racial identity, and b) whether it impacts a sense of belonging at the school. Sense of belonging is one of the critical factors for school success. The theme for Spring 2016 was “Dreamers” as part of a collaboration with the Art Access Gallery. Families created family portraits and visual collages about their immigration and movement stories. This work was part of a gallery exhibit at Art Access during Fall 2016.